A New York publicist recently asked me how she might bring more ‘slow’ to her day. With a busy firm and a client list the length of her arm, she is often overwhelmed by the rigors of her workday. As with other people I have spoken with recently, I find bringing Nature closer to home creates a relaxing atmosphere. No matter whether you live in a city, as she does, or elsewhere, surrounding yourself with beauty is the first step to leading a mindful life. You know the feeling of fighting against your own environment? The cars, the noise, the pollution? The simple act of putting a plant or flowers on your desk can make a huge difference. Add a portable water fountain. The sound of water is a proven way to calm the mind. These things serve to remind you to slow down, hear the rhythm of your own heartbeat, and remember your inner self. Light a scented candle while you watch TV. Improve your diet by adding one thing from outside (and in its original state) to every meal. For instance, eat a carrot stick instead of a sugar-laced juice drink. Think natural to natural. The natural state of the carrot blends with your natural state of health. 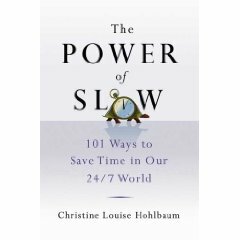 There are many more ways to bring slow to your day, at least 101 alone between the covers of The Power of Slow! I have been to New York City at least five times in as many years. Something has changed in the City. It is softer, kinder, more humane. After spending five days there, I experienced nothing but kindness wherever I went. Someone once told me you see the world through a mirror, not a lens. That which you project is what you see. But there was something more than friendliness returned. There was a deeper level of authenticity I had never known New Yorkers were capable of before. We attended the very last performance of Don Giovanni at the Metropolitan Opera. Right before intermission, the general manager came on stage with the entire cast to honor one of the lead singers for his twenty-five years of service. The award was swathed in a piece of the old Met’s curtain. That they all spoke English, not Italian, pulled me from my reverie. I suddenly realized where I was again (their performance was that convincing ~ the second act was equally so). By doing so, they created a new connection with the audience. These were real people up there doing what they love for us. I felt myself steeped in profound gratitude. Consider my fabulous hotel, Portland Square Hotel, whose unbelievably accommodating staff matches its equally cool location just off Time Square. It had a different feel than I remember it. They cared. And they showed it. Perhaps there’s something in the water on 47th. I don’t know. Cheryl Huse, the hotel front desk staff member remembered my name, cheerfully reminded me of package pick-up as they arrived, and even hugged me at the end. Or Lee, the manager, who skillfully handled an upset taxi driver negotiate another $4 from some British guests who unwillingly stiffed him of some toll money. Or what about the Starbucks next store at the 47th and 6th NHL store location? You’d think Starbucks is the same wherever you go. Not so. These people stood for making a difference. Ted took orders while the baristas carried out our orders. In his loving style, Ted asked us what we preferred, then asked us our names. The best part was he remembered them. With a swarm of caffeine-craving people, he remain undaunted. In fact, his laughter and bright eyes were infectious. It wasn’t only the convenient location that prompted me to go there again. It was the feeling I had while in the store. On the morning of my departure (Sunday) Adam and Andy cheerfully helped a Spanish couple who was struggling with their English. “Hablo Espangol?” Andy asked. Visibly relieved, they ordered in their native tongue. “I know you, but I don’t know your sister,” Adam said to me as I ordered a tall coffee with room for milk. I smiled, then introduced my mom who was celebrating her 68th birthday. He gave her her chai latte for free. So listen up, Jerrel, the store’s manager at the NHL location. Whatever you’re doing, you’re doing it well. We walked away feeling warm on the inside, not only for the hot coffee I eagerly poured into my jet-lagged system, but for the feeling of humanity that has entered New York. Kindness rules no matter where you are in the world. I am inspired by the people I have met. It makes me ask: what kindness can I bring to this day? Safely esconced in the confines of my tiny New York hotel room, I am typing this in rhythm with the traffic nine stories below. I can see why New Yorkers have a hard time slowing down. It is natural for human beings to adapt to their surroundings. As far as I can tell, the Slow Movement has not yet hit the streets of Manhattan. There is a softer lilt to the City now. Cabs are easier to hail as drivers fight for the shrinking pool of rides. Much of what I’ve observed has to do with the financial crisis. I sense more humility, less brash. In a way, the slowdown has slowed people down just a tad. It’s made them pensive, thoughtful, almost inward in a new kind of way. Yesterday’s airport shuttle bus ride taught me a lesson or two about the power of slow. If you’ve ever taken a bus of collective travellers/hotel guests, you’ll know you typically get a free tour of the City before landing at your own hotel. Yesterday’s ride was no exception. After a nine-hour transatlantic flight, I just wanted a shower and some dinner. I noticed how my ungrateful thoughts soured my attitude as I sat in the bus with the other passengers. Then I realized I could take the opportunity to keenly observe my surroundings. After all, that was why I had come to New York in the first place: to feel the vibe of America’s most pulsating city. I was being presented a free tour of New York. Why not enjoy the ride? I started to engage in conversation with the other passengers. Outside the shuttle van I saw more people talking on their cellphones or listening to their iPods than anything else. Even the bus driver checked his PDA at every red light. I made a mental note about the challenges I might face bringing the power of slow to this place. The biggest test of my own slow resolve came when we finally arrived at my hotel. The driver had handed a prior hotel guest my bag instead of his. It wouldn’t have set me into a full-fledged panic if my laptop and hand-edited manuscript of The Power of Slow hadn’t been in said bag. We looped around Time Square (again). It took ten minutes to drive two blocks. An arterial vein almost exploded in my core. “Remember the breathing…” I told myself. Breathe the slow. Love the slow. Embrace the…oh the heck with it! There are moments when impulse just has to take over. Get outta the way, buddy! I nearly shouted at the pedestrian blocking our way to absolution. Moments later, we reached the other hotel. I asked for the hotel guest, whose name we had luckily gotten through our friendly conversation during the ride. He came down with the bag, wearing a sheepish grin. The blood slowly returned to my face as I returned his smile. The very experience of loss and return had given me more than I knew. I now understood how the power of slow, with its softening reassurance, can move mountains…and road-blocking pedestrians when it has to! Nature is balm for the soul. Whenever I feel stressed, I step outside my office and into my garden to dig around in the dirt for a few minutes. Studying the landscape, I inevitably regain a sense of balance and beauty about my surroundings. Internally, I simply feel better having stepped outside the scope of my day-to-day routine. Even urban folks who work a mile-high in the sky can benefit from Nature’s bounty. Rooftop gardening has gained popularity in recent years. The Chicago City Hall has designed a garden atop its building. Tokyo, with over 30 million in the greater metropolitan area, enjoys over 100 hectares of stories-high greenery. In fact, the Tokyo government has ordered that number grow to 1,000 hectares by the year 2017. Rooftop gardens contribute to the cooling of the building and of the Earth itself. If you’re in need of a quick alignment to reembrace the power of slow, go green by going outdoors. Even a houseplant in the wintertime can yield a sense of calm. Dig your fingers into the soil. You might even find a snail, the ultimate slow-goer! Seth Godin recently talked about the pending death of all newspapers. Since I admire his thinking, this has gotten me a little worried. There’s nothing more enjoyable than reading the paper with a steaming cup of coffee in the sunshine on a Sunday afternoon. It is the ultimate slow event as you power down to power up for the week. You can’t curl up to a magazine quite like you can a paper. The smell of it alone brings me back to my six-year-old self. As a kid, I was an early riser, like my dad. We’d both go to the newspaper store on Saturdays to pick up what my dad called ‘the only newspaper worth reading’. He’d hand me a stick of Trident gum while he’d buy the New York Times and a pack of cigars. The overwhelming blend of tobacco and newsprint was stamped on my olifactory memory forever. Ever notice that most car specs focus on acceleration, not braking? It’s more fun to focus on getting fast than it is on getting slow. What would you do if you had a day of nothingness? Would you disappear? Or would your true self emerge?